Carter and Sadie Kane are handed the duty of saving the world once again. They have a mission to revive the sun god, Ra, by finding all three parts of the Book of Ra. By doing so, the two can then stop Apophis, the symbol of chaos, who threatens to put the world into disorder. The action begins as the two Kanes and two other courageous friends discover the first scroll of the Book of Ra at a museum where they barely survive. Afterwards, an important decision occurs when Sadie decides to visit home in London, where she is chased by gods who were cleverly waiting for her and is rescued by the dwarf god, Bes, who eventually becomes a large asset in reviving Ra. The crazy adventures continue as the Kanes search for the three scrolls, with occasional help from gods and magicians. Love and friendship are weaved in and Sadie learns to be grateful, starting with a particular friend, Walt, because he has an incurable sickness.Those who were kind showed Sadie and Carter that they must treasure their friends. In the end, with a mixture of skill, luck and friendship, the Kanes find all the scrolls and revive Ra. The Kanes are in a tough situation when they must gamble with Apophis, but Bes is wise and selfless and is chosen as Apophis’ victim. From all this, the Kanes learn to trust their friends greatly and lead more adventures with them in the future. This book is very fast-paced and thrilling, with monsters, spells and excitement jumping out every few pages. For those who like this style of writing, this is a great story to read. 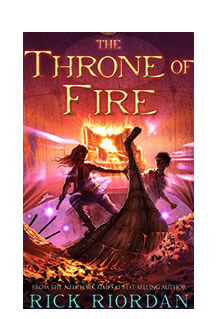 The description and vivid choice of words also allows readers to dive deep into the world that Riordan has created. However, the story lacks a distinguishable theme. There is an obvious goal for the characters to save the world, but there are only subtle hints to find the deeper meaning and theme of the book. The skill level required to read this book were also on the low side. Vocabulary was not weak throughout the book, but there was not much content to decipher, unlike in Lord of the Flies and other such books. In general, I give this book eight out of ten stars. 1. How does Carter teach his trainees? 1a. He teaches by letting them use magic hands-on, instead of lecturing out of a textbook. 2. Why does the vulture goddess choose Sadie’s grandma as her host? 2a. Since vultures pick on weak or dead things, the vulture goddess chose the person who would make Sadie the most weak. 3. Why are dwarves respected by Egyptians? 3a. Dwarves are intelligent and considered extremely powerful, so Egyptians honor them greatly. 4. Why does Bes drive Sadie to a river to fight the gods? 4a. It is harder to gods to anchor themselves onto the mortal world when there is such a powerful force of nature flowing underneath them. 5. Why does Walt give Sadie a gold necklace with that particular Egyptian symbol? 5a. The symbol is a never-ending loop, the symbol of eternity, which represents eternal luck. 6. In the infirmary that Sadie’s ba traveled to, how are patients’ conditions monitored? 6a. Patients’ conditions are shown through the candles changing color. 7.Why are secret names of gods and people useful? 7a. Secret names are the sum of someone’s experiences and represent someone’s entire life. Therefore it is a powerful way to control gods/people when used. 8. How does Sadie receive the location of the last scroll of the Book of Ra? 8a. Set offered a deal where Sadie gives Set back his secret name and she receives the location of the last scroll in return. 9. What do the planets that Mad Claude say refer to? 9a. Some Roman gods have planet names and since Mad Claude is Roman, he refers to gods with their Roman names. 10. Why does a platypus appear after Ptah simply says “platypus”? 10a. This is because Ptah is the god of creation and it happens when he is not focused. 11. Why does Menshikov wish to wake Ra (right now)? 11a. Menshikov tried to restore Ma’at before by waking Ra, but failed and now seeks to wake Ra for revenge. 12. How do Sadie and Carter manage to survive the fire waterfall? 12a. Sade paints protective fire glyphs on herself and Carter, which creates a shield of protective flames. 13. Why does Sadie say: “We’d already lost”? 14. Why does Bes say “Boo!” to the monsters? 15a. One is the real sun and the other “sun” is Sadie, Carter and Ra on the sun boat.